The introduction of Insolvency Code has brought flood of changes in the business sector making India a favorable place for trade and commerce. Because of insolvency laws, recovery of bad debts has become quiet easier as compared to previous tedious methods of civil procedure. 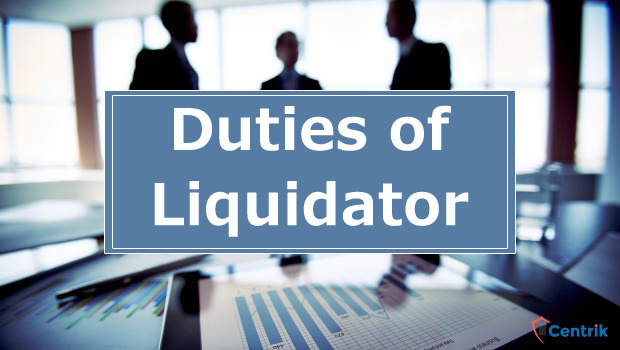 In this article we have discussed about the duties of liquidator who is appointed by the Authority to take care of the liquidation process of the corporate debtor. To verify claims of all the creditors. To take into his custody or control all the assets, property, effects and actionable claims of the corporate debtor. To evaluate the assets and property of the corporate debtor in the manner as may be specified by the Board (IBBI) and prepare a report. To take such measures to protect and preserve the assets and properties of the corporate debtor as he considers necessary. To carry on the business of the corporate debtor for its beneficial liquidation as he considers necessary. Subject to section 52, to sell the immovable and movable property and actionable claims of the corporate debtor in liquidation by public auction or private contract, with power to transfer such property to any person or body corporate, or to sell the same in parcels in such manner as may be specified. To draw, accept, make and endorse any negotiable instruments including bill of exchange, hundi, promissory notes in the name and on behalf of the corporate debtor, with the same effect with respect to the liability as if such instruments were drawn, accepted, made or endorsed by or on behalf of the corporate debtor in the ordinary course of its business. To take out, in his official name, letter of administration to any deceased contributory or his estate which cannot be ordinarily done in the name of the corporate debtor, and in all such cases, the money due and payable shall, for the administration or recover the money, be deemed to be due to the liquidator himself. To obtain any professional assistance from any person or appoint any professional, in discharge of his duties, obligations and responsibilities. To invite and settle claims of creditors and claimants and distribute proceeds in accordance with the provisions of this Code. To institute or defend any suit, prosecution or other legal proceedings, civil or criminal, in the name of on behalf of the corporate debtor. To investigate the financial affairs of the corporate debtor to determine undervalued or preferential transactions. To take all such actions, steps, or to sign, exercise and verify any paper, deed, receipt document, application, petition, affidavit, bond or instrument and for such purpose to use the common seal, if any, as may be necessary for liquidation, distribution of assets and in discharge of his duties and obligations and functions as liquidator. To apply to the Adjudicating Authority for such orders or directions as may be necessary for the liquidation of the corporate debtor and to report the progress of the liquidation process in a manner as may be specified by the Board (IBBI).